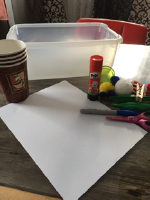 As early childhood educators, we like to work on various concepts that will ensure children are kindergarten-ready. Letter recognition, counting, and tracing basic shapes are but a few of the concepts that we include in our daily activities. 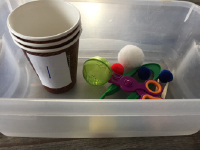 Here, I would like to share a simple math game that will help children learn to count objects. It’s easy to make and fun for children. I suggest leaving it in a clear plastic bag in your board game area. Children will enjoy playing with it independently or with a friend during periods of free play. Step 1: Cut the piece of cardboard into ten small squares. Number each square (from 1 to 10). 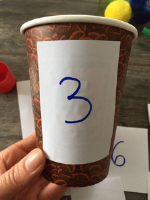 Step 2: Glue a number on each drinking glass. 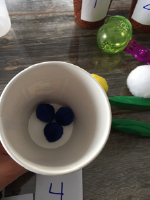 The object of the game is to set the corresponding number of pompoms or cotton balls in each glass. 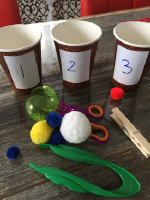 Children must recognize the numbers and count the pompoms or cotton balls, setting them in the drinking glasses one by one. To work on children’s fine motor skills, you may have them use ice cube tongs to set the pompoms in the glasses. Adjust the number of drinking glasses per the capacities of the children in your group. 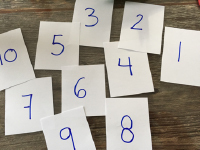 If, for example, children can easily count to 5, use six glasses numbered from 1 to 6 to encourage them to go one step further than what they can already do. If you wish, you could explore colors instead of numbers and simply have children sort the pompoms per their color.